Erosion by major tributaries of the Brahmaputra in Lakhimpur district of Assam continues to affect thousands of people at different places well ahead of the onset of the monsoon. Massive erosion by the Subansiri, the biggest tributary of the Brahmaputra has displaced hundreds of families at Ghagar-Kalakhowa under North Lakhimpur Revenue Circle. The fast advancing river has eroded a wide populated area in Ghagarghat, just seven kms away from the district headquarter North Lakhimpur, thus forcing the already displaced families to move further away from the river bank with their meagre belongings. 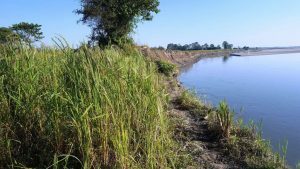 The erosion also has shrunk the agriculture fields in this area as lands with standing paddy were lost to the erosion during the pre-harvest season this time. The river is eroding many areas in Hekerajaan, which witnessed massive erosion last year in Kadam Revenue Circle area of the district. The same river has also caused widespread erosion in Bhimpora area under Bogeenadi Development Block and in Alimur, Somdirimukh and Adisuti in North Lakhimpur Development Block. 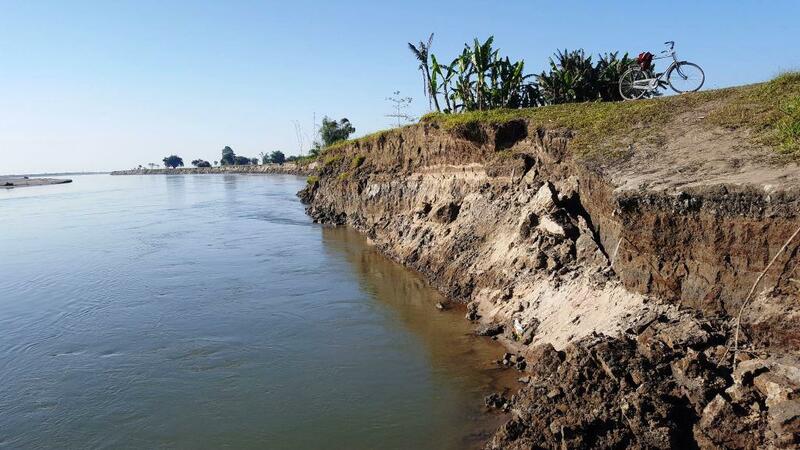 The riverine villagers of these areas are apprehensive that the continuous erosion by the Subansiri even before the monsoon season could cause severe destruction later. The same river has also eroded extensive areas in Koliyani, Kolakhowa, Morichiga and Ghagar villages under North Lakhimpur Development Block. The erosion-affected families of this area, who have been taking shelter on a rural road since 2013, are now endangered further as the fast eroding Subansiri has hit the road in Ghagar. About 10 families have been displaced by the recent erosion by Subansiri in Major Chapori, which destroyed wide areas of agricultural land in Elengee and Majgaon villages. The villagers are demanding pre-emptive measures by the authorities concerned to check the continued erosion in their areas before the start of the rainy season. The Subansiri has been eroding a wide area of agricultural land and human settlements since October last year, thereby affecting 45 families of the village in that area. Most of these families were forced to leave their homes by the erosion and had been staying on a road near the river bank. In Dhakuakhana subdivision, erosion by the Brahmaputra at Jugisuti has been destroying hundreds of acres of agricultural land since September last. In the same subdivision, massive erosion by the Subansiri continues to affect scores of people at Bhimpora and Bogeenadi.